Fun with languages is a comprehensive hands-on guide that helps you improve your command of foreign languages, build self-confidence, and understand why you're failing in certain areas beyond your linguistic abilities. A great, modern supplement for learning a foreign language. Full of interesting and useful tips and suggestions to make the tasks more interesting and engaging, including how modern technology can aid in the process and keep us connected to other speakers and learners of the foreign language. I really like the suggestions that encouraged learners to connect with other speakers and learners of the language, both in real life, as well as over social media. One of the most challenging things about learning a language is finding opportunities to practice, and this book is full of helpful suggestions to do so. Like scavenger hunts, throwing parties, role-playing, and storytelling. Also useful were the ways it advised the reader on how to learn a language beyond a book. I found the suggestions to listen to music or read comics in the native language particularly useful. Since music is often repetitious, it's a great way to learn phrases, as well as to pick up an accent. Comics are great because so much of the meaning is conveyed through images, which can really aid in comprehension. Another important piece of advice was how to learn to comprehend the spoken language. With a reminder that hearing is passive, but listening is active, it got to the heart of why it is so difficult to understand a language, even after pouring hours into studying it. Overall it's a great collection of techniques and will take your journey into learning a new language to the next level. I have always wanted to travel and immerse with other country's native people and their culture, and have always been interested on how traditions are passed down and preserved for hundreds of years. A way of course to successfully do this is to learn at least a basic of the country's language. So, if you're on the verge of learning that second or third language, this book is perfect for you. The author highlighted the benefits of learning a foreign language, the importance of making the learning as part of your routine, and she enumerated ways on how you can overcome the negative beliefs and misconceptions that may hinder you from learning that foreign language you've always wanted to master. The author also gave practical, convenient and more accessible ways to how you can effectively improve, practice, read, write and lastly, speak the language. This book is not only fun and compact but also has a concise set of guidelines on how you can put to heart your chosen second or third language. Fun with Languages is such an incredible resource! As someone who has always been interested in improving their spanish, I couldn’t have discovered this book at a better time in my life. It gave me the push I needed to start to improve my spanish with practical and easily applicable tips and tricks to help. The author does a fantastic job of explaining everything the book, from the benefits of learning a foreign language to how you can work on improving the skills you already have and learn new ones. The best part of this book is that the suggestions are really doable for everyday life. Nothing seems too far fetched, or that it would be too hard to try in order to help further your learning. I took note of so many things when reading this book, and I can’t wait to try the different ideas to improve my conversational Spanish. I’ve already tried listening to my first audiobook in Spanish, which was such a fun experience! So many people want to learn more languages, and author Monica Di Santi is really helping people achieve this dream with her book. I know I’ll be keeping this one on my shelf until I’ve mastered my Spanish speaking skills! As someone who has tried to learn a language for some time and then, given up, this book proved to be very useful for me. Monica Di Santi made it all so easy. One of the best parts of this book is that the author encourages one to learn from what he/she loves. Listening to songs, audiobooks, watching movies and playing games are things that most of us love to do. She shows us exactly how we can get double benefit through these; having fun and learning a language at the same time. Secondly, this book is more like a face-to-face conversation with an expert who guides you on how to master foreign languages with tasks that are enjoyable and tips that in fact, spike up your motivational level. She has emphasized on how one should reward oneself for the little efforts, laugh, share jokes and have quality time with friends and family. She does not burden the reader with tasks or assignments but instead provides support in a way that automatically inspires one to work hard. Lastly, I loved how the author has explained that we can use things that we use on a daily basis or for entertainment, to improve our language skills. Mobile phones, blogs, videos, movies, songs, newspaper, articles, forums, internet, games and so much more is available to us and we can make use of them to our benefit, all without difficulty. This book taught me that I can truly have a lot of fun while learning languages and made me realize that my struggle will be worthwhile. I would definitely recommend this book to anyone who intends to or is leaning a foreign language, as I believe that this book will help anyone as much as it has helped me. A great book for learners, it is! Fun with Languages: Tips and Tricks to Master Foreign Languages Easily By Monica Di Santi is a well thought and comprehensive complementary guide to whichever foreign language you are currently studying or intend to start learning. It is a magnificent prepared and organized book that covers a plethora of all the issues that someone might consider while studying a foreign language or she or he is on the verge of starting educating themselves to a new foreign language. The book is covering in remarkably condense structure the benefits of learning a foreign language, how to create a nice habit, how to keep yourself motivated, how to be a successful learner and overcome negative beliefs. It provides a few books that support her claims and methods which I personally found absorbing and useful. At the same time, the quotation from many sources shows that the author did her homework and one thing I like is a good research book. 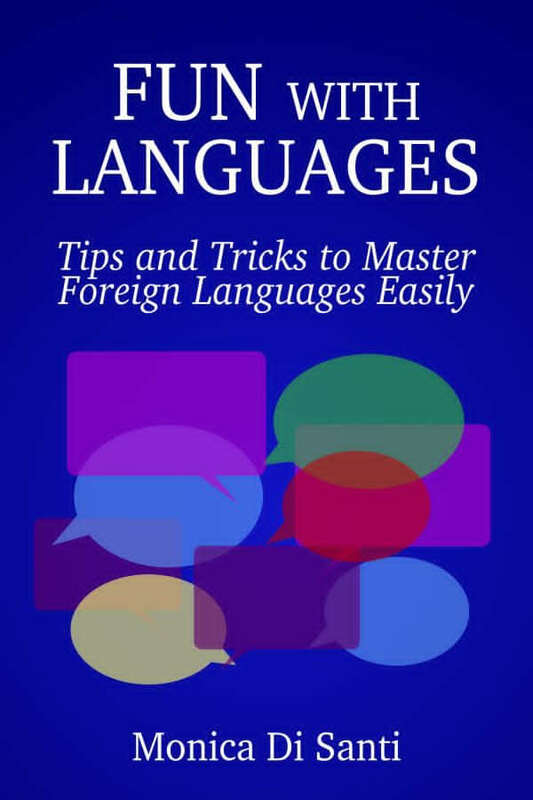 The book also covers issues of how to work with a foreign language, what to pay extra consideration like poor listening, how to improve your pronunciation, how to write in the foreign language and many more helpful and exciting methods and ideas. Another part of the whole learning a foreign language which is covered in the book is how to learn using technology, how to use humor as an educational venue, how to use multimedia like songs and music to excite and get involved as many of our senses in the learning process. Finally, the author offers ideas methodologies and ways for you to enjoy your foreign language abroad. There is a detailed and complete list of what to have in mind when you are planning for a journey abroad. The traveler’s checklist and the trip safety tips are well researched, and I actually learned a lot. Exquisite complementary philosophical and practical at the same time guide for learning a foreign language. After two years in a foreign country, it’s still challenging for me, as an Eastern citizen, to learn a Nordic language, even if as a student, learning the Slavic languages was a piece of cake due to the similarities with my mother tongue. The fact that I took classes and I used all kind of apps to improve my skills helped at the beginning, but became annoying in time. Having access to Monica Di Santi’s book pleasantly surprised me. Thanks to her professional background, the author came up with a comprehensive and straight to the point guide based on tips and tricks which have a positive provoking logistic, revealing different aspects (both positive and negative), which helped me understand better my linguistic abilities and also the reasons for why I got stuck. Reading this book (re) built my self-confidence in the situation mentioned above, and I would highly recommend it to everyone who feels stuck in the position of learning a new language. It’s a great asset! It's an easy-reading book that teaches you how to enhance your foreign language learning, no matter what level you have. Tips apply to any language you are learning or refreshing. It helps you improve listening, writing, speaking and reading. "Fun with Languages" makes you feel comfortable with the level of language you know, encouraging you to go ahead. Fun with Languages. Tips and Tricks to Master Foreign Languages Easily by Monica di Santi is a little guide to encourage all those who are interested in learning a foreign language but they can't find the sources, time or money. The book starts with an introduction about motivation and empowerment “Motivation pushes you forward, but only routine keeps you going.” She mentions the importance of routine and habits beyond setting your goals. I found interesting the fact that she stops at the idea of “neurological patterns” to explain how our mind keeps the information and processes it. We need more than setting goals to reach our objective. We need effort and love for what we're working on. Di Santi's bull's eye is to create a kind of romance between the reader and the target language, inciting us to get some poetry, music, lyrics... linking positive emotions to our horizon. She gives advice about some resources to practice your skills, like joining forums, social media groups, creating relations with other foreign people, encouraging to ask your friends to be part of the process and doing activities together which help you all grow in your target. Also getting video games, listening to audiobooks or watching video clips. The last part of the book is a little insight about traveling, giving advice to save money, tips about booking, choosing and behaving abroad. Mentions the idea of staying at some family's home, she appeals to create adventure and enjoy life. This book is energetic, quick and direct. Di Santi is a very positive writer, incise and encouraging. Learning a new language takes perseverance, patience and ambition. I recommend this book to all those who don't know where to start from when they want to dive in a new knowledge, even beyond what the subject is. A fresh and constructive little introduction to make the most of yourself and not giving up on feeding off your mind.